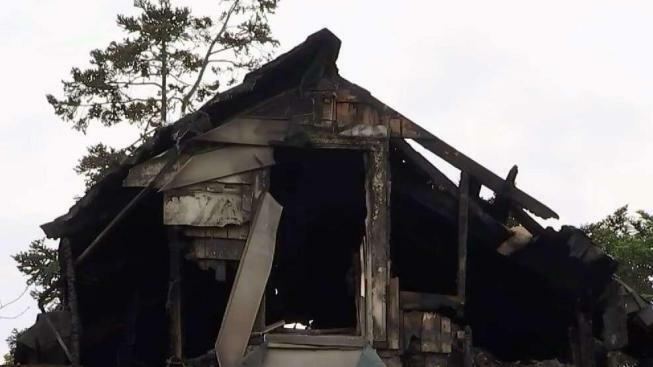 A mother of three has died after a fire at a 1920s-era farmhouse in Beltsville, Maryland, early Saturday. The woman's children had stayed with other family members overnight, investigators have confirmed. "I know she had a baby, she had a little baby, and she had two teenagers, and it's so sad that just on the eve of Mother's Day, the kids will not have any mother," neighbor Christie Abegesah said. Neighbors called 911 about 3:30 a.m. Saturday to report the blaze in a two-story home in the 11400 block of Howard Court, said Prince George's County Fire & EMS. The fire was so heavy that firefighters couldn't get inside the house at first and had to battle the flames from the exterior. When they finally were able to enter the home, they found the woman inside. The woman was pronounced dead at the scene. Her name has not yet been released. More firefighters were called in to extinguish the fire. In all, it took 60 firefighters nearly 90 minutes to put it out. Fire officials said the home was built in the 1920s. It was the original farmhouse for the property, where single-family homes were later built behind Behnke Nursery off Baltimore Avenue. Due to significant damage, including burned-through floors, "a limited amount of interior overhaul and salvage could be performed," fire officials said. Damage is estimated at $200,000, they said. The cause of the fire is still being investigated. Preliminary reports indicate the fire appears to have started toward the back of the house, officials said. Firefighters are also checking to see if the house had working smoke alarms. First responders did not hear a smoke alarm, and crews have not yet found one. This was the ninth fatal house fire in Prince George's County this year. There were only five in all of last year. In each of thoses cases, the house did not have the proper smoke detectors. Later Saturday, firefighters will be back in the neighborhood to pass out smoke alarms to try to prevent more tragedies.